Africa Health is the continent’s largest healthcare exhibition and retain its reputation as the ultimate platform for Healthcare professionals and medical experts from across the SADC region to address specific healthcare needs by driving change in healthcare delivery and keeping up to date on the latest developments in the medical science. This year’s conference had up to 10,000 healthcare professionals and 550 exhibitors from more than 62 nations attending the conference. Running alongside the exhibition were 13 conferences and workshops where healthcare professionals were provided with valuable education and latest updates in the medical field. I had the opportunity to witness cutting edge products and innovation from Poland, Germany, Brazil, Turkey, South Korea, China, Spain, Italy, Pakistan and South Africa. Africa Health has its most attention to medical equipment, Surgicals, orthopaedics, patient monitoring, x-ray and radiology. Laboratory IVD products was a separate Laboratory IVD conference in September which will definitely attend. Giant suppliers such as Olympus, Haier, Biotech, Medcare, SafMed, B.Braun, New Avakash and Abbot to mention a few where exhibiting. I was sure to bring relevant brochures for new suppliers for our local customers. 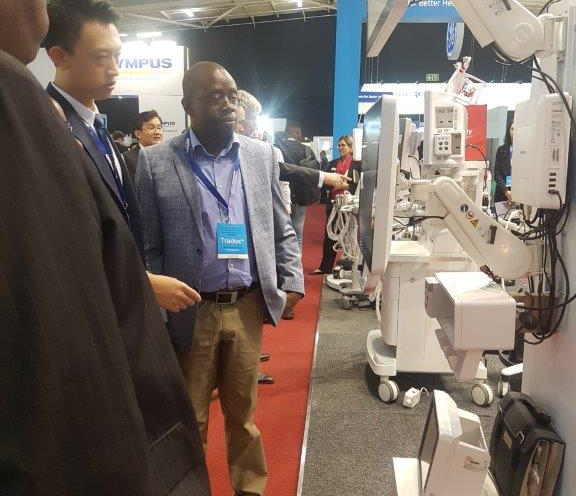 Local competitors such as Careplus Health, Diagnostic Labs, KDB, Shreesai and Lab assist attended the same conference alongside our local customers from Parirenyatwa, PSMI, Harare Hospital, Baines Pathology and MOH. Mindray hosted a Gala dinner for us, its Africa Customers. Highlights of the event included New product lauch and International projects. Recognition to Zimbabwean Market through PSMI was echoed. Mr Mubvumbi was awarded an opportunity to testify his experience with Mindray products and he surely didn’t disappoint. Mindray on the last day of the conference held Distributer hands on training which I also had an opportunity to attend.